A high fidelity test version of NASA’s Advanced Plant Habitat (APH), the largest plant chamber built for the agency, arrived at Kennedy Space Center in Florida last week. The engineering development unit arrived by truck, was offloaded and transported to a laboratory at the Space Station Processing Facility. Inside the lab, NASA engineers, and scientists and technicians on the Engineering Services Contract will train with the test unit to learn how to handle and assemble it before the actual APH unit arrives early next year. They also will test how the science integrates with the various systems of the plant habitat. NASA Kennedy engineers designed parts of the APH, but also fabricated the flight growth chamber, with the remaining subsystems designed and built by ORBITEC in Madison, Wisconsin. The unit is a closed-loop system with a controlled environment than can house large plants. 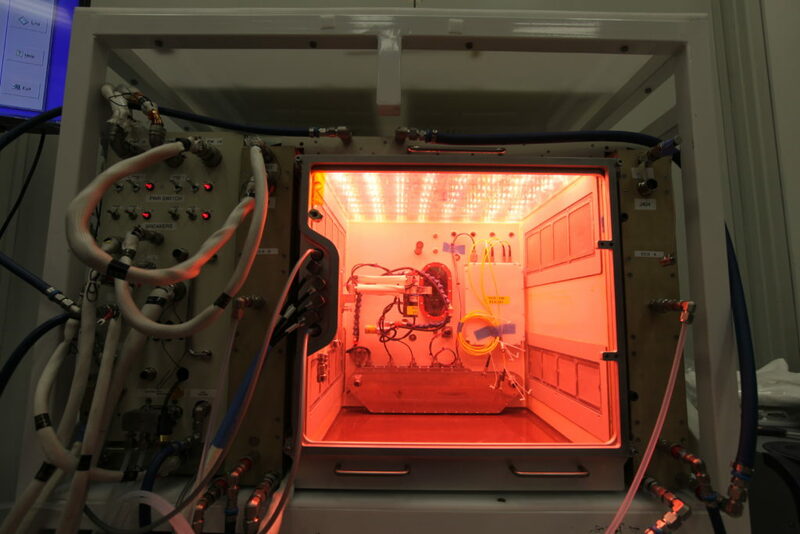 The system will use red, green and blue LED lights, similar to the Veggie growth system that currently is on the International Space Station. The APH also has the capability of using white LEDs and infrared light. The APH will have about 180 sensors and four times the light output of Veggie. Kennedy scientists developed the science carrier that will be inserted in the APH for plant growth experiments on the space station and the control experiments on the ground. Payload integration engineers with Jacobs, on the Test and Operations Support Contract, will help integrate the science, or seeds, into the APH. Jacobs research scientists also are providing lab space and support for the APH. The small-scale experiment, called Plant Habitat 1 or PH01, will contain Arabidopsis seeds, small flowering plants related to cabbage and mustard. PH01 and the APH unit will be delivered to the space station in 2017.